Once your plants are growing, perennial garden care will probably take you about two or three hours a week, as long as your garden is a reasonable size. What you need to do will fall under plant care, watering, dividing overgrown plants in spring or fall, or garden maintenance, edging to keep the lawn grass out of your beds, deadheading finished flowers and weeding. Looking after these jobs regularly will keep your flower garden looking lush and colorful. Planting: Job number one is, of course, getting your plants into the ground. Here are basic guidelines for planting perennials. Mulching: Mulch helps make your flower beds look neat, but it does a lot of other good things for the garden, especially conserving moisture and keeping weeds in check. Learn about types of mulch and how to apply them. Watering your perennials: Like all plants, perennials need enough water to keep them growing and healthy. Read how to water wisely and effectively. 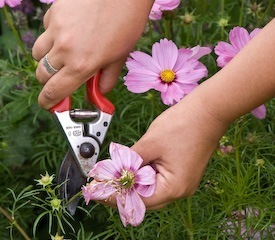 Grooming and deadheading: Every couple of weeks, cut back any floppy plants or flowers that have finished blooming. This keeps the garden looking good and promotes fresh new growth. See the benefits and how-to of deadheading. 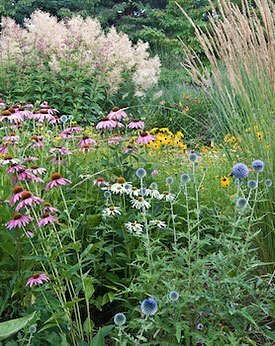 Perennial garden care – weed control: Weeds are tough and fast-growing, so you need to keep on top of them to make sure they don’t take over. Avoid planting into weedy beds, especially those filled roots of perennial weeds. Find out how to prevent weed problems. Dividing perennials: Division is one way to control the size of perennial clumps that get too big or outgrow their spots, and it’s also a great way to increase your supply of perennial plants. Learn more about which plants to split and why, plus the how and when of dividing perennials. Garden edging: Here’s how to create sharp-looking boundaries between your lawn and your perennial flower garden. 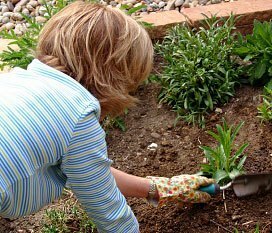 Read about several practical garden edging methods. Mid-summer garden spruce-up: Sometimes, despite our best efforts, bad weather, drought or getting too busy to keep up, our garden will look a bit ragged by mid-summer. Here’s a mid-season tune-up to refresh your garden. You can do this over a weekend or two. Getting your perennial garden ready for winter: As the season comes to an end in the fall, follow this checklist to get your yard and garden ready for winter.